Europe is overlooking a gigantic bond-market precipice. Yield on the Spanish two-year government bond is up a whopping 60 basis points to 5.76%!. Yield on the Spanish 10-year bond is up 26 basis points to 7.27%. Italy is participating in the bond debacle as well. Yield on the Italian 10-year bond is up 17 basis points to 6.17%. This action in the face of another “we are saved” moment less than two weeks ago tells a dramatic story elsewise. Protesters took to the streets of 80 Spanish cities on Thursday night after prime minister Mariano Rajoy’s People’s party (PP) pushed a €65bn (£51bn) austerity package through parliament and the country paid record prices to borrow money from sceptical markets. 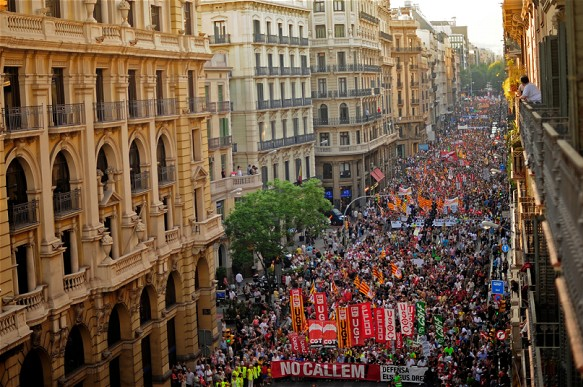 More than 100,000 people were estimated to have joined in demonstrations called by trades unions, with about 50,000 gathering in Madrid. Police fired rubber bullets to disperse the protesters in Madrid. Angry civil servants had blocked traffic in several main Madrid avenues earlier in the day, with protesters puncturing the tyres of dozens of riot police vans, amid growing upset at austerity, recession and 24% unemployment. “Demand for Spanish paper is collapsing, even for shorter-dated debt which is very worrying and raises the spectre of Spain losing market access,” said Nicholas Spiro from Spiro Sovereign Strategy. Marchel Alexandrovich from Jefferies Fixed Income said the markets are already bracing for second bigger rescue of around €400bn. “A few more weeks like this and Madrid is going to decide to it has nothing more to lose and call for a full sovereign bail-out,” he said. “Then we will find out if there really is any money in the EU kitty. Please read that last paragraph carefully. I disagree strongly with the finance minister. This is not “beyond ideologies”. Instead it is precisely about the foolish ideology of staying in the eurozone at all costs, including 25% unemployment and tax hikes upon tax hikes. Also note the misstatement (or misquote), the VAT need to be hiked to “stay in Europe”. I assure you Spain will stay in Europe regardless of what happens, and it can stay in the European Union as well. The correct alternative, is for Spain to leave the European Monetary Union. Stubborn ideology, unfortunately, is still in the way. At some point, however (and this could be it), Spain is going to hike the VAT one time too many. At that juncture, the willingness of Spanish voters to stay on the euro will fly right out the window.